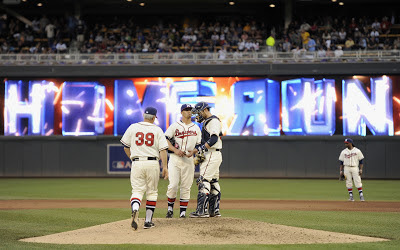 Last night, in Minneapolis, the Brewers participated in their second Turn Back the Clock game of the season honoring our American Association Brewers. The first, a game at Miller Park commemorating the centennial of the Brews' first pennant, was an event I had been involved with for nearly a year. 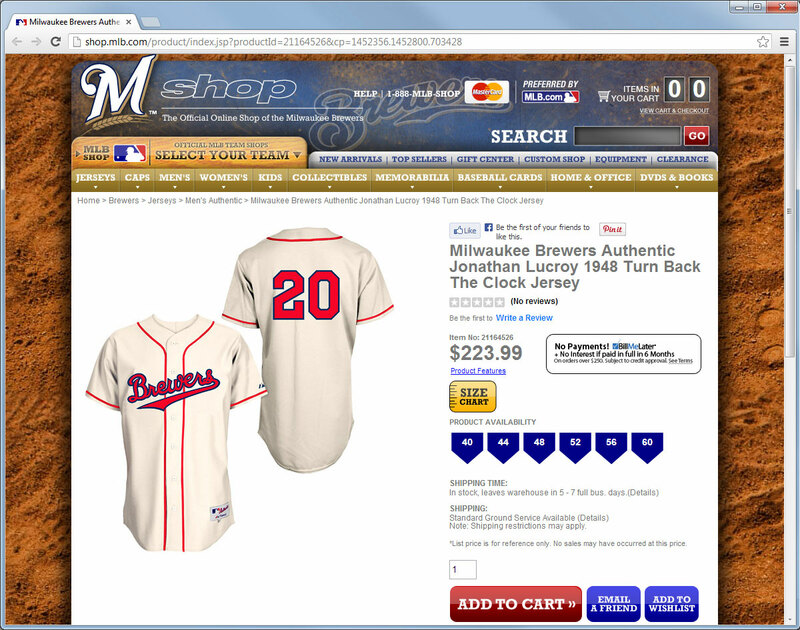 I first suggested the game to ONMilwaukee.com's Doug Russell in May of 2012, and worked with the Brewers on and off throughout the late summer and fall with research on the uniforms. By the time the event was officially unveiled, I had lived with it long enough that it seemed almost an afterthought. The Twins' announcement earlier this month that they and the Brewers would hold a 1948 TBTC event, by contrast, came right out of the blue. I hadn't heard anything about that one, a very welcome surprise. These events are coordinated (and paid for) by the home team, and like the Brewers earlier this year the Twins hit a home run. 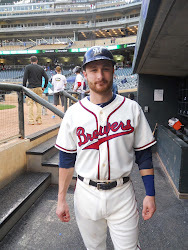 The uniforms were based on a surviving 1948 jersey worn by catcher Walt Linden that surfaced at auction last year. Majestic made one significant revision in their reproduction, replacing the original zipper with a button-up front, but other than that captured the spirit precisely. 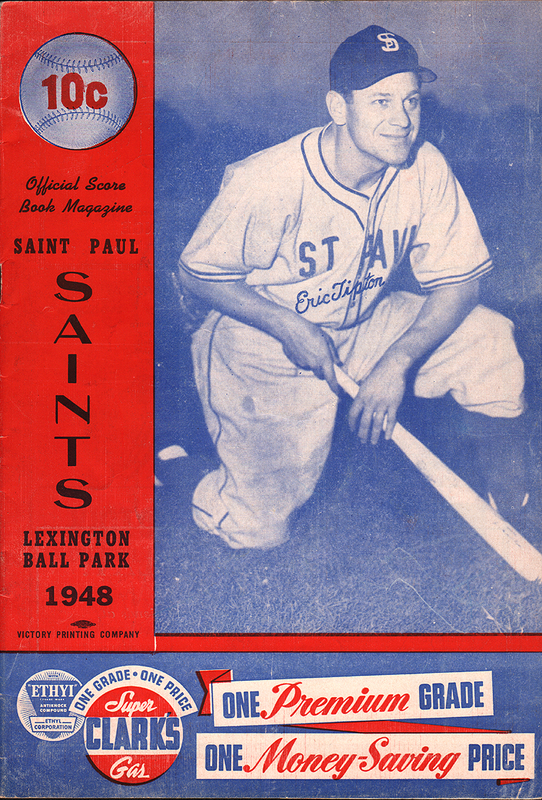 The Twins played the game as the 1948 Saint Paul Saints. 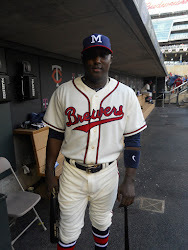 Each of the Twin Cities had their own representative in the American Association; the Millers from Minneapolis and the Saints of Saint Paul. 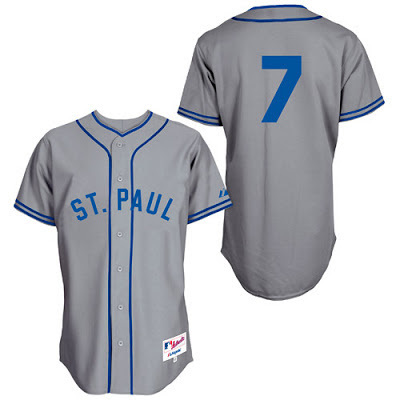 For this game, the Twins not only elected to play as the Saints but to wear Saint Paul's road uniforms: gray with blue piping and lettering. 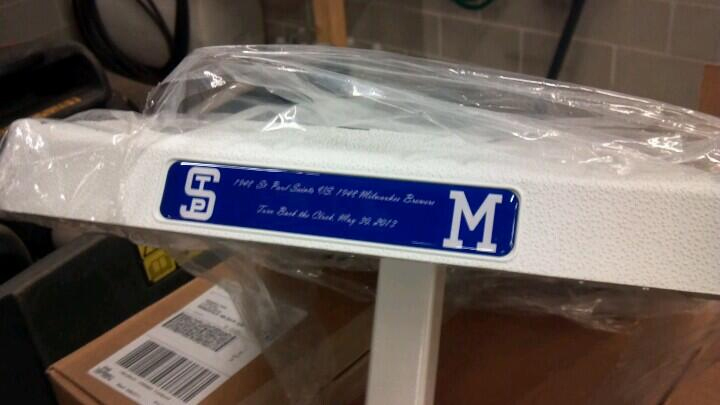 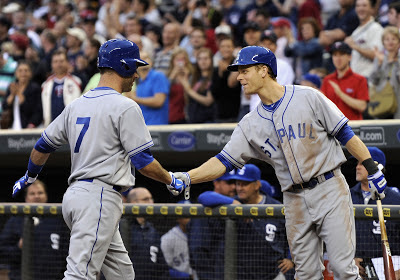 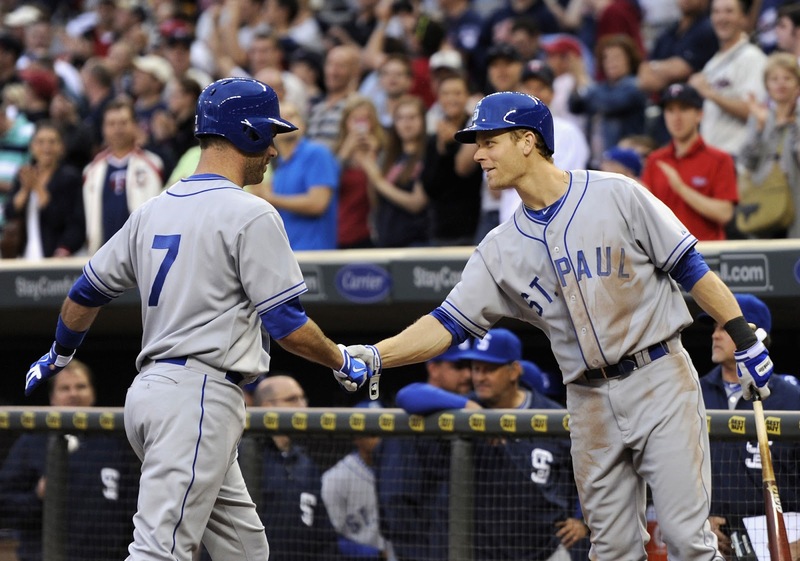 The official reason for this decision was to give Saint Paul-born Joe Mauer the opportunity to wear his hometown's name across his chest, but I also wonder if the existence of the new independent St. Paul Saints club might not have had something to do with that as well. 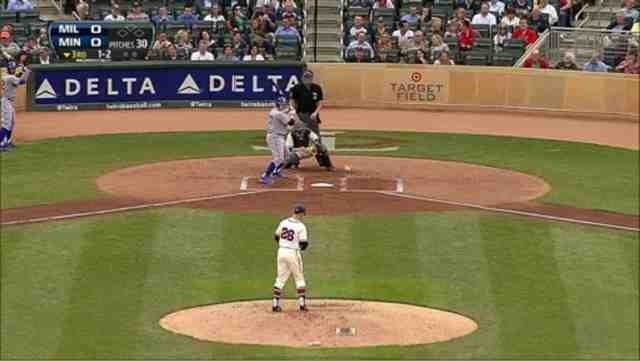 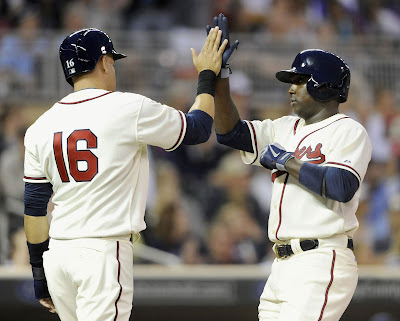 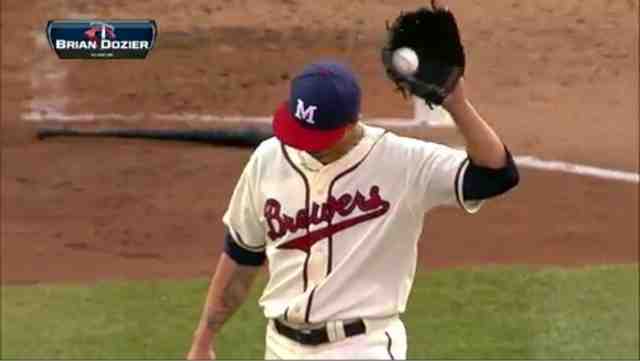 Regardless of the reason, the Twins took the field in road grays and the Brewers in their home creams. 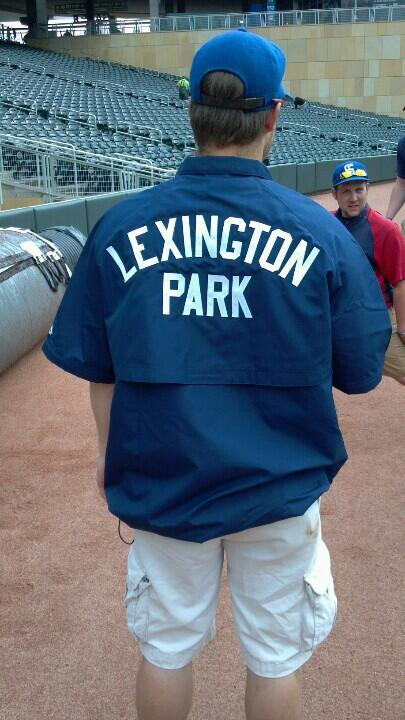 The Twins' ground crew got into the act with "Lexington Park" jackets, reflecting the Saints' old ballpark. Although clearly a modern jacket in cut and fit, the style of the lettering reminds me of the Grounds Crew jackets sold by Ebbets Field Flannels in Seattle. Interestingly, Ebbets currently offers a Borchert Field version, and one for the Millers' Nicollet Park, but Saint Paul is currently not represented in their catalog. Surely they could have at least worked up a block "M" decal; a rare oversight in an otherwise excellent event. 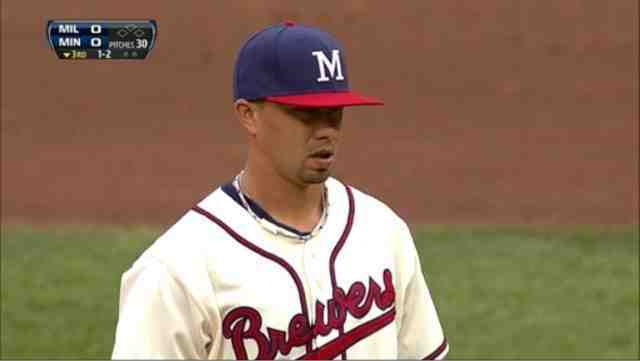 Note also the modern style decals on the back of Ramirez's helmet: the Times New Roman "16" and navy/gold batterman. 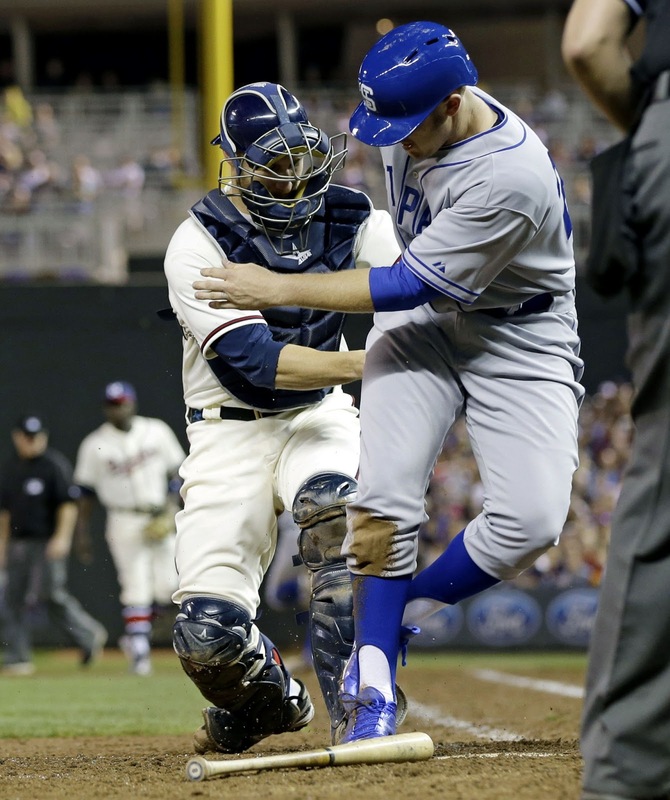 The wheels started to fall off in the third. 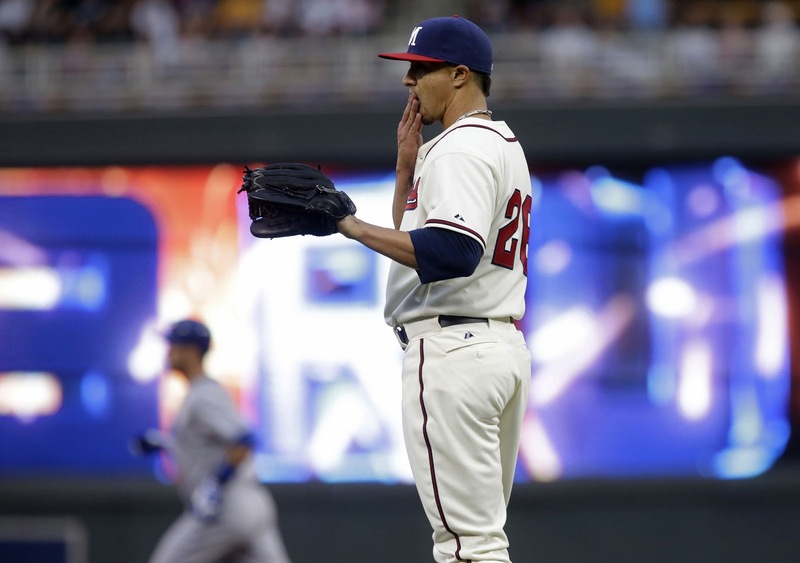 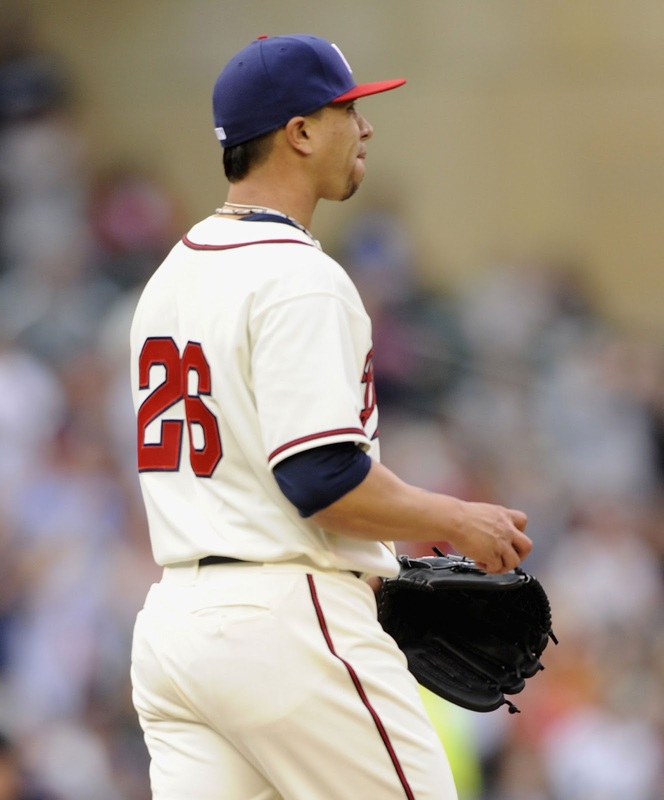 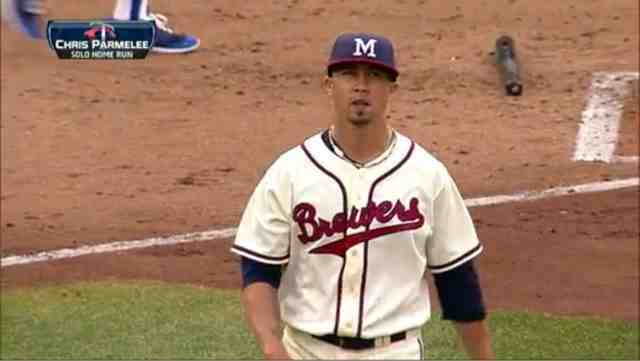 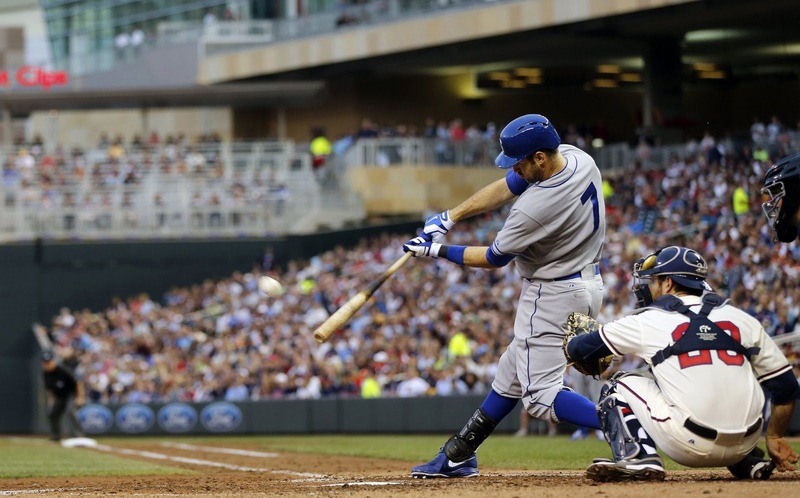 Lohse give up four home runs to stake the Minnesotans to a 6-0 lead in the fifth inning. 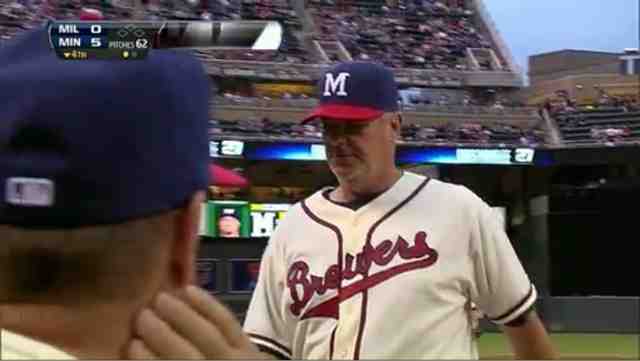 That means today most of the widely-disseminated photos we have of the game involve a very unhappy-looking Lohse. 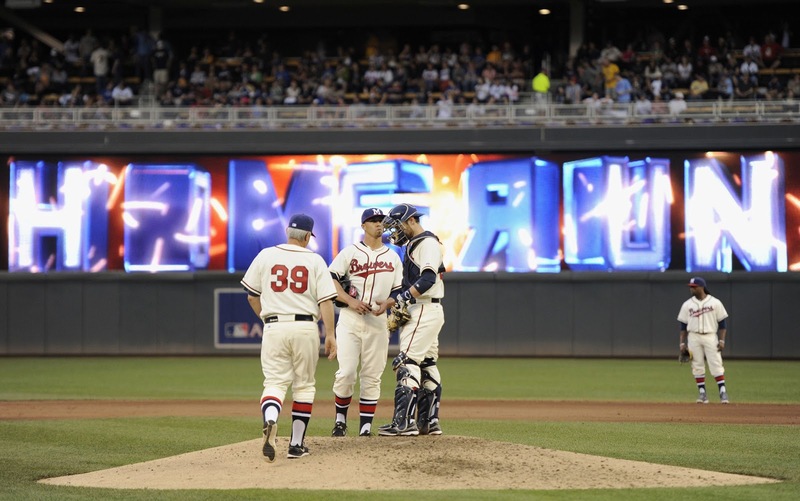 Not to mention this picture of a mound visit. 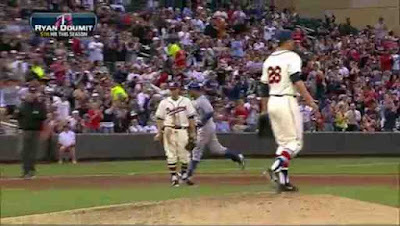 The Brewers were able to come back in later innings, even making a game of it, but in the end fall to the "Saints", 6-8. The game was a frustrating one for Brewer fans (something we're used to this season), but could hardly have been better for fans of Milwaukee's baseball legacy. 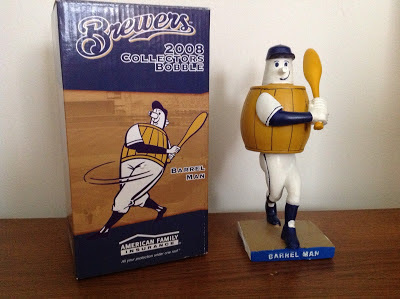 As we continue to look ahead to the Brewers' Turn Back the Clock to 1948 game this week in Minneapolis, let's look at the artifact that made it possible. This beautiful Brewers jersey was sold at auction about a year ago. 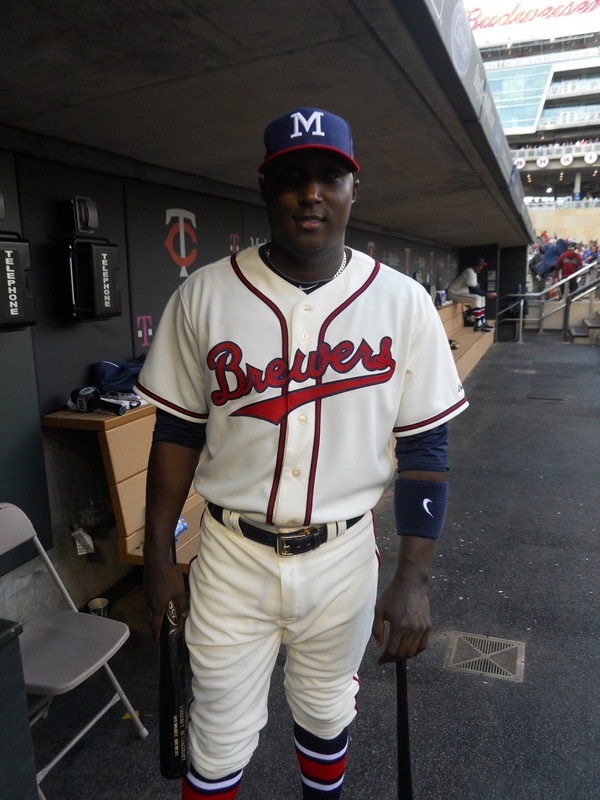 It illustrates a team in transition from longtime independent operator to the top level of the Boston Braves' farm system. 1948 Walt Linden Game Worn Milwaukee Brewers Jersey. 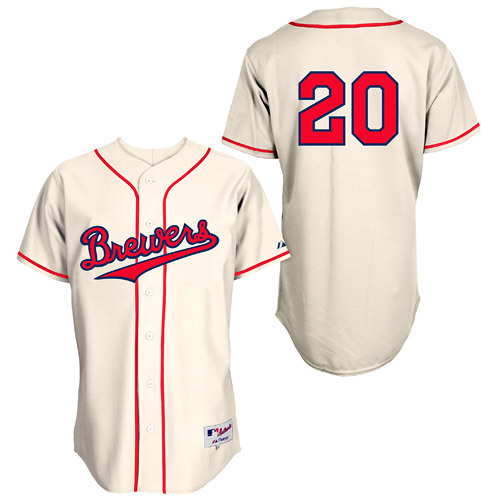 Home white flannel was worn by catcher Linden as a member of the Boston Braves affiliate Milwaukee Brewers (Triple-A, American Association). Functional zipper front bisects "Brewers" in red and black felt on chest. 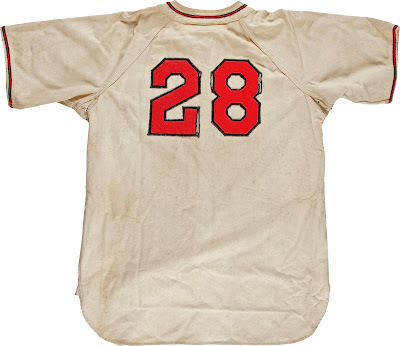 Number "28" on verso has some seam separation but remains firmly affixed. "Linden" embroidered swatch appears beneath "Wilson [size] 42" tagging at interior collar. Solid wear throughout. It's a gorgeous jersey, in amazing shape for being sixty-five years old. 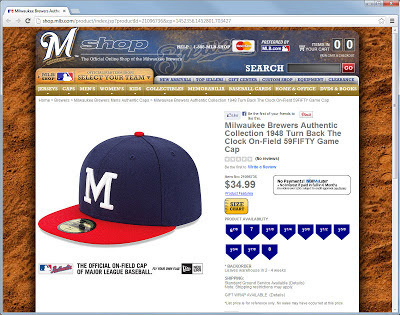 The catalog description captures it well, even if the trim is actually midnight navy, not black. 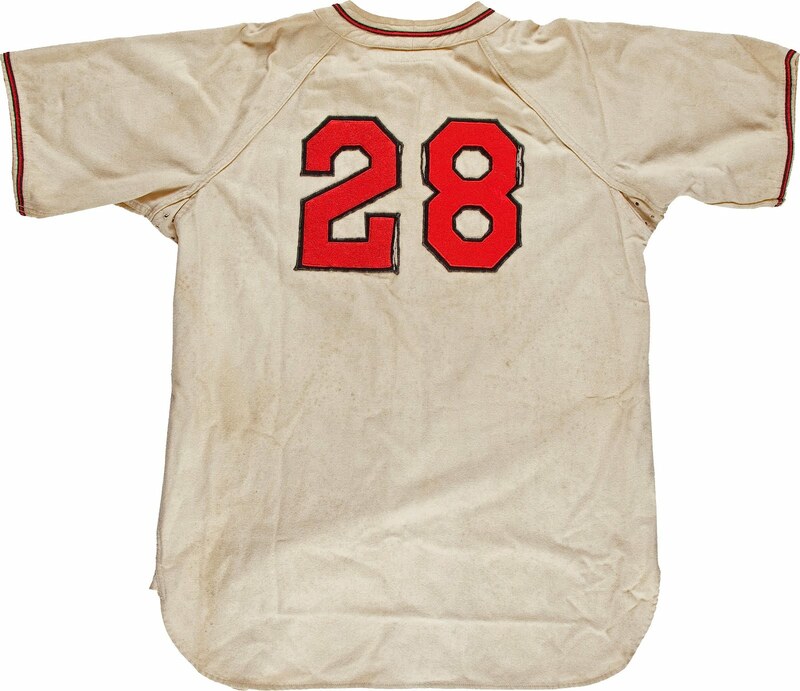 Although this particular jersey is from 1948, the design dates to the previous season and represents a stepping stone between eras in the team history. 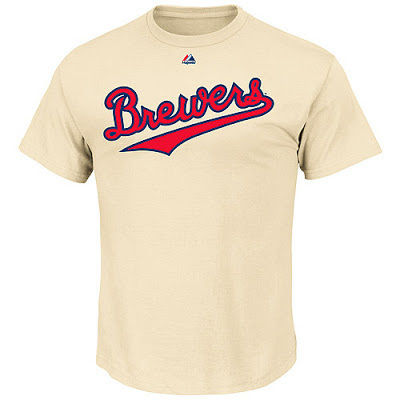 The "Brewers" script itself was introduced in 1942, part of a re-branding from new owners Bill Veeck and Charlie Grimm. 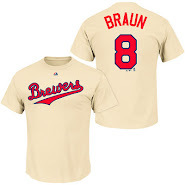 That design lasted until 1946. 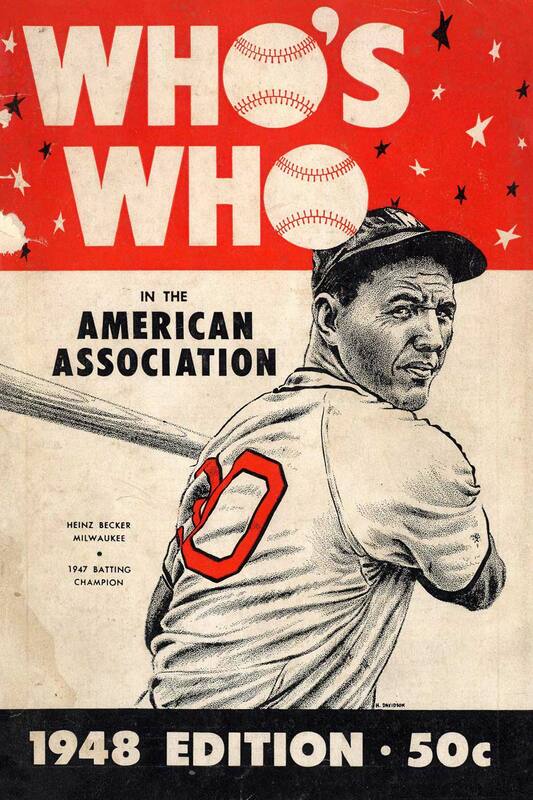 Veeck had sold the club to Chicago attorney Oscar Salenger in October of 1945, but Salenger was unable to fund the transactions needed for the club to stay independent. 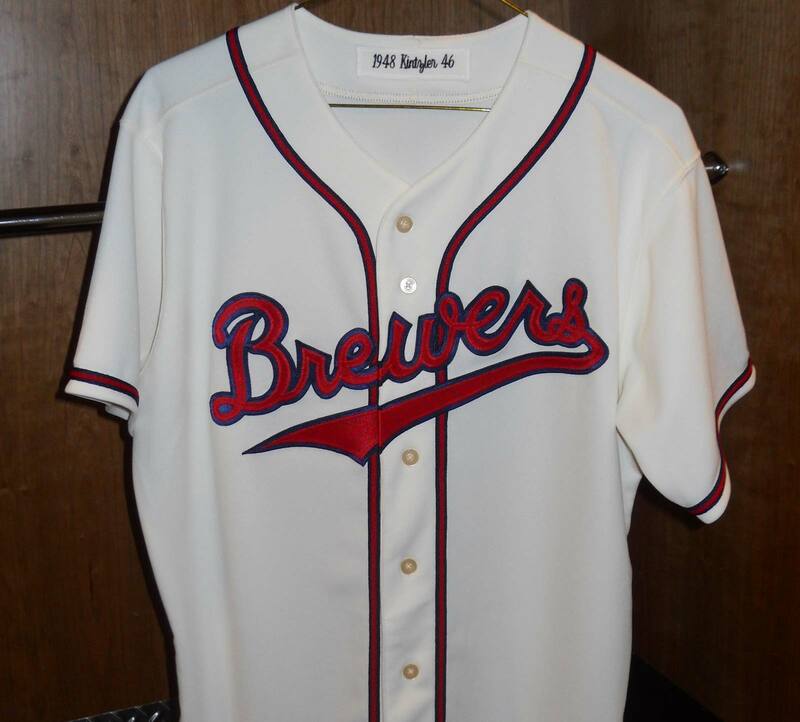 After fielding interest from the White Sox, among others, Salenger sold the team to Lou Perini, owner of the Boston Braves, near the end of the 1946 season. 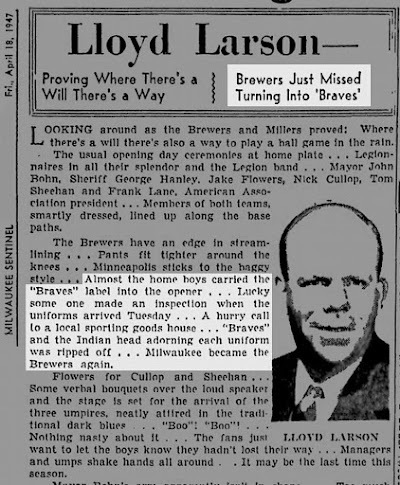 Beginning with the following Opening Day, in April of 1947, the Brews started looking a little more like the Braves. 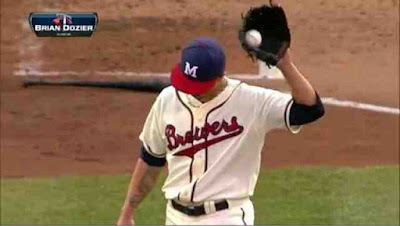 The Brewers' dark royal blue was replaced by Braves navy, the single-color thick blue soutache with the Braves' thin and distinctive navy/red/navy piping. 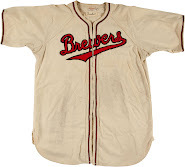 The Brewers did keep their elegant 1942 script, if in the new color scheme, for the first several seasons they were in Boston's chain. 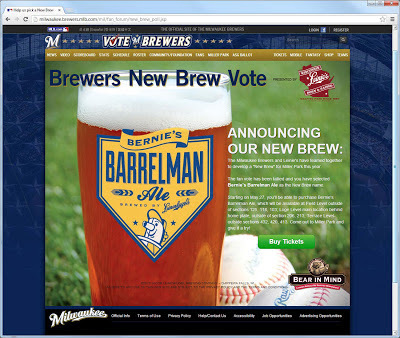 Fortunately for the Brewers, a snowstorm pushed the opening back one day, giving them time to correct the mistake. 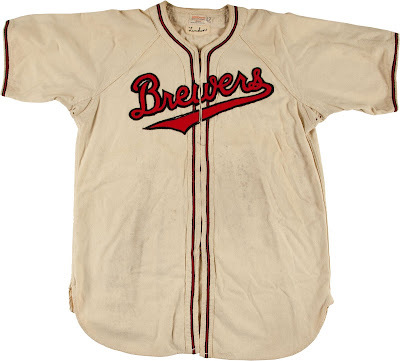 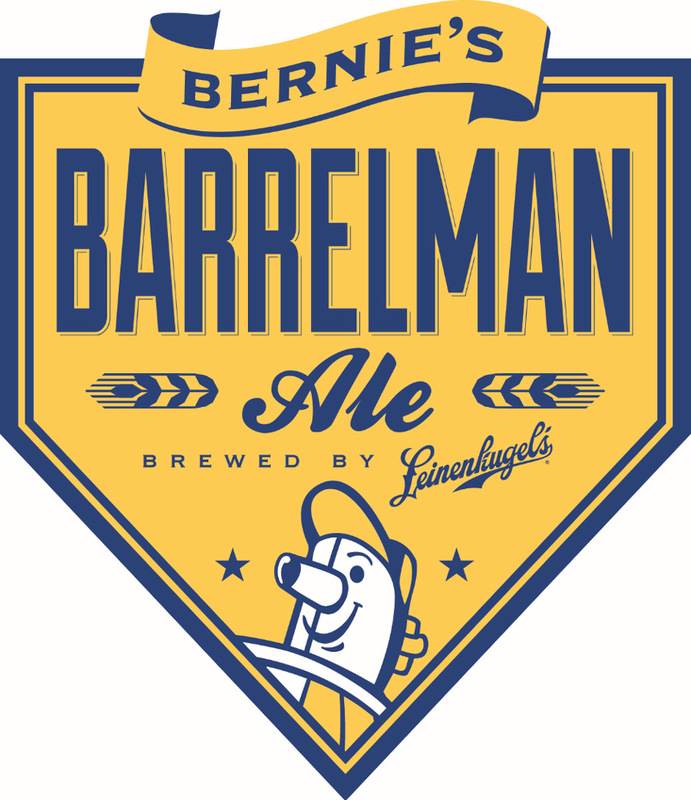 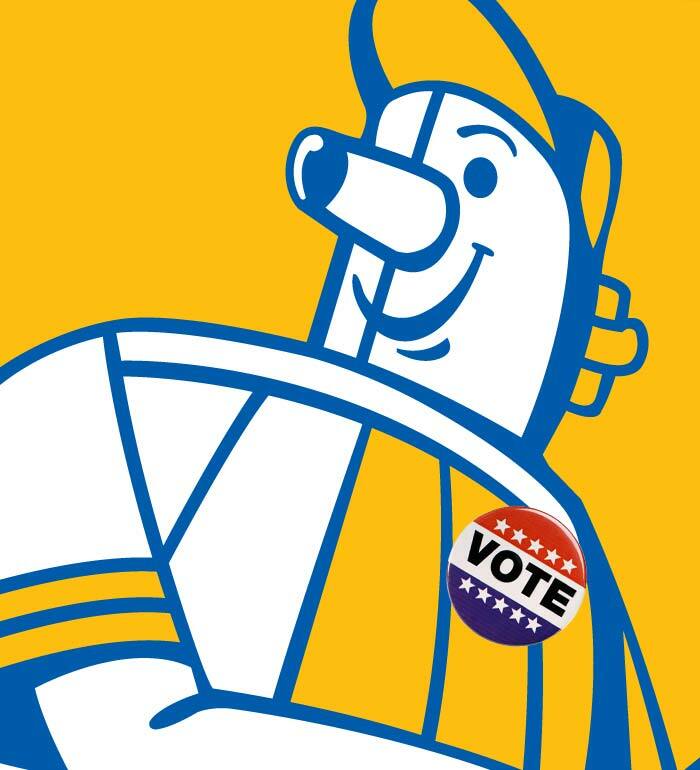 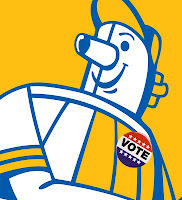 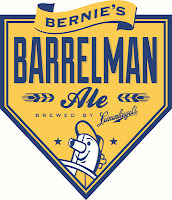 They made "a hurry call to a local sporting goods house"—possibly Burghardt, which had been supplying the Brewers at least since the early 1930s and would have been familiar with their chest script—and the new jerseys were stripped of their Boston iconography and repurposed for the Brews. 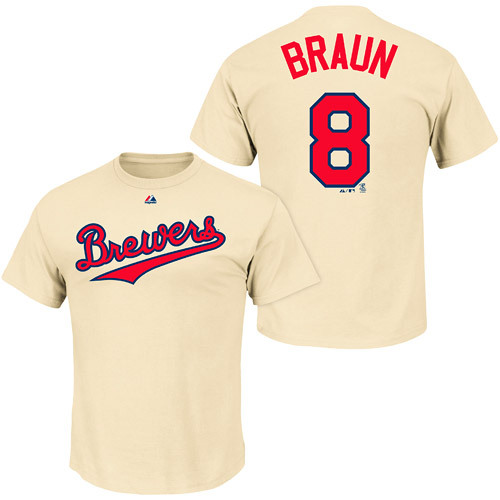 This jersey needed no such alteration; this style, intentional or otherwise, was retained for a second season and arrived from the manufacturer with the Brewers name laid over the Braves-style piping. 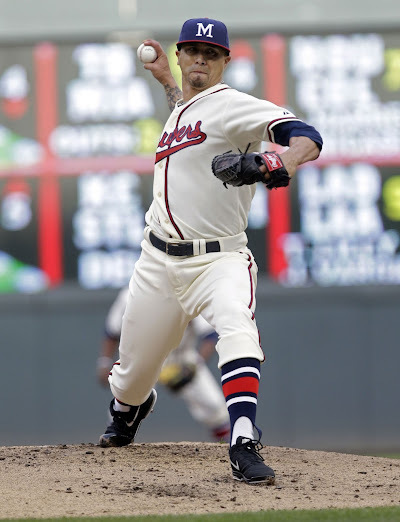 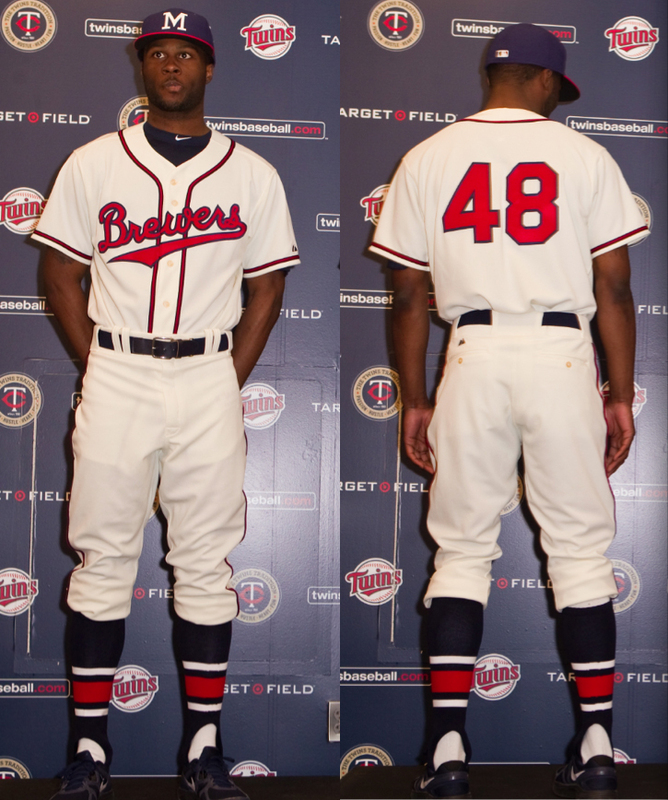 The design would continue to evolve, culminating in the near-clone of the Braves' uniforms they would adopt by 1952. 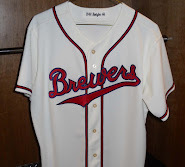 As for the man who wore our exemplar in 1948, Walt Linden was a catcher who spent eight years in the minors, most of it in the Braves' farm system, playing at Borchert Field for parts of the 1947, '48 and '50 seasons. 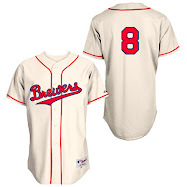 In 1948, he started with the Brewers but only played in five games before being shipped to the Braves' lower-level club in Hartford, Connecticut. 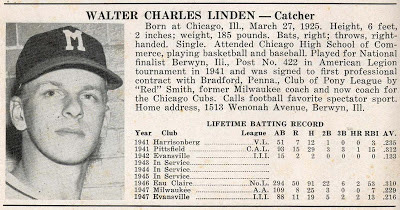 He persisted with the organization and finally broke into the big club's roster with a three-game cup of coffee in 1950. Linden's entry in the 1948 edition of Who's Who in the American Association mentions that he was signed to his first pro contract by Red Smith, who was a longtime Brewer coach and personnel man but in 1948 was coaching for the Cubs. That entry also highlights a uniform development that was new for '48: a white block "M" on the caps to match the parent club's "B". 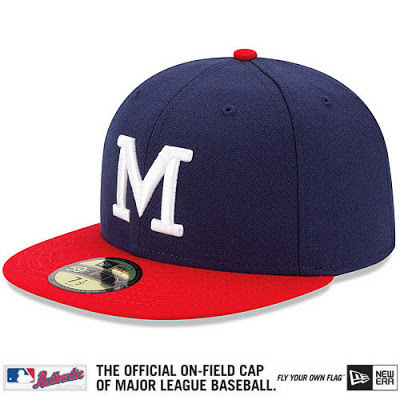 In 1947, the Brewers were wearing navy caps with red bills and "M"s.
I doubt that we would see our National League Brewers in 1948 uniforms had this particular example not recently come to light. 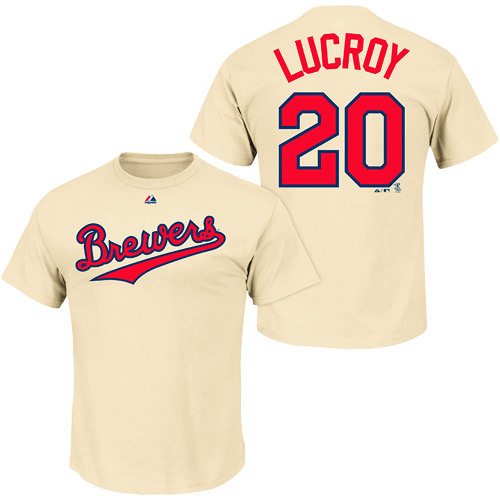 I also can't help but notice that the two jerseys available for sale on MLB's online shop utilize digits from the distinctive number set on the back of this jersey. 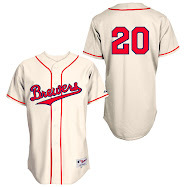 This jersey is an important piece of Milwaukee's baseball history, preserved through the years and now passed down, via the Minnesota Twins, to an entirely new generation of Brewer fans.